As a nonprofit dedicated to the greater good, the Paramount & Stateside Theatres is reliant on support from people like you. This fall, we need your help to complete timely testing on the south exterior wall to assess damage and deterioration from aging and weathering. Help support important preservation work on the historic Paramount Theatre by making a donation today! Make your donation by Jan. 1 to receive exclusive preservation partner benefits. Read more about these benefits and the important preservation work needed below! Make your important donation before January 1, 2019 to receive these great benefits. The first phase of this project is creating custom-engineered scaffolding based on the unique footprint of the Paramount Theatre. 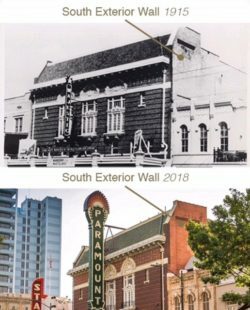 From the beginning, this project faces a unique challenge — the position and location of the Paramount. The south wall is part of a fire alley for the theatre that cannot be blocked. Engineers will construct custom scaffolding to perform surface testing that will keep emergency exits open at all times, so the theatre remains operable. Next, testing and analysis can be performed on the wall damage. Once the scaffolding is in place, analysis will begin on the wall. Walking down Congress Avenue, you can see extensive damage at the top of the wall near the roof: broken bricks and cracked mortar line the highest part of the theatre. Results from testing the surface, brick and mortar will allow our preservation team to understand the scope of damage. After this, careful and informed restorations can be started on the wall. Will you help us preserve the Paramount? for details regarding this donation.